(Mister) Finnigan heads into next week’s Bathurst Gold Crown 2YO series heat a last-start winner after winning a two-year-old race at Menangle (transferred from Newcastle last Saturday) on Tuesday, March 19. (Mister) Finnigan, shown at the Rangiora trials in late January with trainer, Mark Jones. 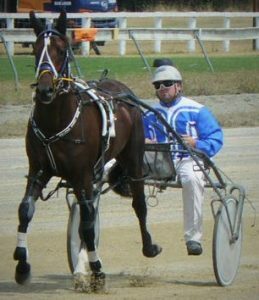 Burnham trainer Mark Jones also has Barrett, who ran fourth in a Menangle trial on Tuesday, in the Bathurst Gold Chalice 3YO colts and geldings division. The $100,000 finals will be run at Bathurst on Friday week, March 29. (Mister Finnigan) was untroubled to win as a hot $1.20 favourite on Tuesday, leading from the four gate for driver Guy Chappie. The Art Major-Virginia Khan colt held by 4.6 metres in 1:56.1 (1609m). This was his first win in four New South Wales starts, having placed at his fisrt two attempts at Newcastle. He’s the fourth to race and fourth winner for his dam Virginia Khan (1:58.5, five wins), a daughter of D M Dillinger and Margaret Khan, by Genghis Khan. Her earlier winners include Koora Khan (1:54.9, five wins), Modern Maestro (1:55, 16 wins & $100,615) and Lookamekymay (2:02.9, two wins). Barrett finished fourth to close relative Lets Go To Brazil in Tuesday’s trial, won in 1:55.3. Lets Go To Brazil (1:52) a colt by Rock N Roll Heaven, is from Miss Brazilian, a Mach Three half-sister Priceless Gem (1:55.5), the dam of Barrett. The Michael Doltoff-trained Lets Go To Brazil has won five of 11 starts for $58,650. Barrett, an improving colt by top sire Bettor’s Delight, has won three, and been three times placed, in 12 NZ starts this term.